The bulldogs within Underdog Rescue have a separate adoption process from our other pets because taking on a bulldog is a much different responsibility than taking on other breeds. 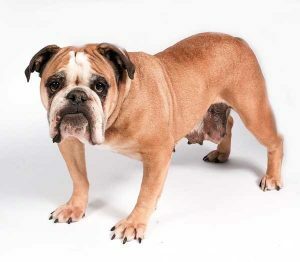 Bulldogs require different needs, such as air conditioning, fewer stairs, understanding of medical needs, and knowledge of brachycephalic breed issues that may arise. We will evaluate applications based on those needs as well as the specific needs of the individual dog. We consider the bulldog application useful for any breed that falls in the brachycephalic breed. Before completing this application, please be sure to read through our ADOPTION PROCESS and ADOPTION FAQs. We have chosen to require an application fee for all bulldog applications. On an average our volunteers evaluate over 500 applications a month, a large percentage of those are for our available bulldogs. Of those applicants, many fall through because of factors like applicants not being fully prepared to take on the responsibility of a bulldog. We believe that our volunteer resources would be best spent on applications that are prepared and ready to take on this change in their lifestyle. By taking the time to read through our information, fully complete the application, and pay the application fee you are taking the first steps in showing us that you are committed to providing a stable home for the life of this dog. The bulldog application fee is $25. Please note, fees are non-refundable. Bulldog applications and fees are good for 6 months. If you are unable to adopt the dog you originally applied for you do not need to reapply and pay the fee within 6 months for a different bulldog. You may email us at apps@underdogrescuemn.com to have your application updated. The application fee is applied to our organization and helps to fund areas in need. This could range anywhere from food for foster dogs to medical care expenses for our more serious cases which often are bulldogs. Underdog Rescue is a registered 501(c)(3) Non-Profit, click HERE for more info. Please note, application fees are non-refundable. -You live within 60 miles of the Twin Cities. -You are able to provide a home which has air conditioning. -You are able to demonstrate an understanding of a bulldogs need and have researched their medical, financial, and socialization needs. -You are committed to providing a high-quality diet for the life of the dog. Grain Free diets are required at minimum. After reading through our Adoption Process and Adoptions FAQs pages as well as all details on the bulldog’s adoption profile, pay the Application Fee. Once the adoption fee has been paid, click HERE to fill out the bulldog adoption application. Bulldog Applications will be responded to within 5 business days, after receipt of the application fee. Please understand that paying the fee does not guarantee you will be approved to adopt the bulldog. Our goal is to place bulldogs in homes that are suited to their individual needs. You may be willing and able to provide a great home, but if it doesn’t meet the specific needs of the dog, we will not approve your application. We accept applications for bulldogs until we have a candidate that meets all of the requirements needed for the specific puppy and they have been contacted to review the adoption process as well as agree to all of the terms to move forward. Bulldogs are a member of the Brachycephalic breed and therefore have a host of health issues that may arise. Because these dogs are new into our rescue, health issues in the future may arise that we are not aware of. Some of these issues are allergies, eye issues, yeast infections, interdigital cysts, slipped disks in their back, breathing problems, among a host of others that can occur at any time or when seasons change. While breed experience is not required, we encourage you to thoroughly research the breed and its financial, medical, and environmental needs to be sure the breed is a good fit for you and your family. It is estimated that the average bulldog owner spends $2,000 per year on medical needs. In addition to the normal pre-adoption surgical work up of a spay and dental, many of our bulldogs receive a surgery to enlarge their nares and also to shorten their soft palates. These surgeries are needed to improve their breathing and increase oxygen and airflow so the dog can be an active and happy member of your family. Bulldogs are one of the most expensive dogs to own, maintain, and rescue and our adoption fees reflect such expenses. 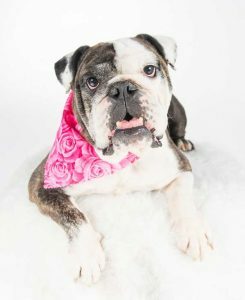 The application process for bulldogs usually moves quite quickly as they are a popular breed, so we ask that adopters do research and be prepared for adoption at the time you submit your application. They are happy, goofy, playful characters and we are excited you are taking the first steps into rescuing one!